With the demand for physical gold such as coins and bars having picked up recently in the wake of gold’s recent price decline, it’s worth taking a look at the differing characteristics of physical and paper gold and why the physical variety of the yellow metal may be a better choice for your IRA. Investors are constantly told that diversification among a variety of different assets and asset classes can help reduce risk in their portfolio. What they aren’t often told is that the same type of approach can be used to try and reduce systemic risk, which refers not to the risk of your assets losing value or becoming impaired, but to the risk that the institution or organization where your assets are held itself goes under or runs into difficulties. If your IRA holdings consist strictly of paper assets, whether in the form of mutual funds, gold ETFs, or similar instruments, you run the risk that your ability to access the value represented by these assets is compromised by a system-wide failure or the failure of the firm holding those assets for you. While gold of all sorts, paper and physical, might well rise in value if inflation or a market crisis arises, if your gold is held within the system in the form of a paper certificate, gold ETF, or something similar, you run the risk that in a systemic crisis your ability to access and benefit from your holdings is restricted or even negated. Exactly how this might happen is impossible to predict, but the recent decision of the major bank ABN Amro to pay cash on its gold contracts instead of physical gold is one example. Another example is the bankruptcy of futures broker MF Global, which saw some of its customers losing part of their investments held with the firm as well as being unable to access some of their holdings for a time. If you hold paper gold at major IRA or 401k custodians such as Fidelity, Charles Schwab, Morgan Stanley, Goldman Sachs, or Bank of America, how well-protected would you be in the event of some sort of systemic collapse? While this type of risk is difficult to forecast, the point to be made here is that if you hold physical gold in your IRA rather than a pledge to deliver gold, you have the peace of mind of knowing that your assets are not a product of paper promises should the system seize up. Since the repeal of the Glass-Steagall Act, all the major financial institutions, such as the ones mentioned above, gamble with their clients' assets, which is partly to blame for the 2008 economic meltdown and directly to blame for JP Morgan's 2012 multi-billion dollar loss. Due to the repeal of the Glass-Steagall Act, large banking firms which were previously unable to take risks with their depositors’ money have been free to do just that in recent years. When they make good choices little is heard of the issue, but when the choices they make backfire big losses can ensue, as was seen recently with JP Morgan and the “London whale” incident. While JP Morgan has survived those losses, in the 2008 crisis firms such as Bear Stearns and Lehman Brothers were not so fortunate. This is not to say that any of the big wall street banks or brokers are in any danger currently, just that the system which allowed them to take risky bets and which played such a large part in the 2008 crisis is, for the most part, still in place. As a result, keeping your IRA assets with any of the large or small banks and custodians subject to the system which caused the crisis in the first place carries a degree of risk which some investors may want to avoid. 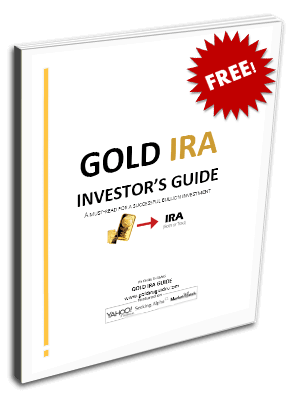 While most IRA custodians do not allow physical gold or other precious metals to be held in an IRA, a special type of IRA known as a Gold IRA allows for approved precious metals, including certain gold, silver, platinum, and palladium coins and bars, to be held. This enables investors who want to hold at least a portion of their assets outside the system to do so in the form of assets which have historically performed well during times of crisis, especially when those crises lead to inflationary outcomes. Physical gold has the important virtue of not having any counterparty risk. As outlined above, if you own paper gold of one sort or the other you still face the risk that the issuer of that promise, or the bank that holds it, runs into difficulties. Whereas with physical gold, you get the peace of mind of knowing that its historic role of protecting your purchasing power is not subject to the risk of becoming a mere paper promise.